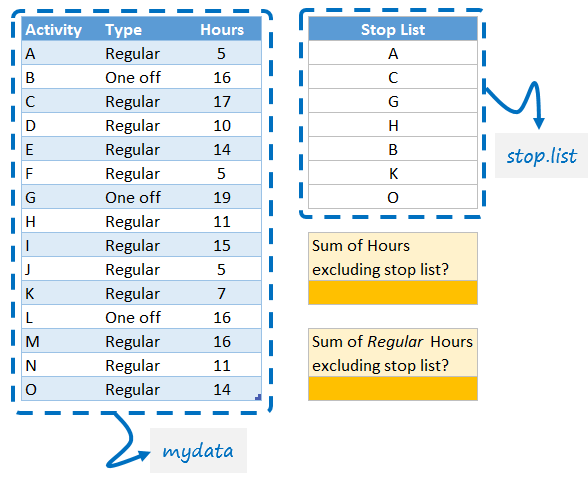 Imagine you have a table named mydata with a few columns and a stop list named stop.list as shown below. Attempt below home work problems as well. Sumerian voter problem – Can we vote yet? How many Mondays between two dates? How many hours did Billy work? Did you forget to attach the sample file? There is no attachment MF. No, I couldn't do it in one formula. I had to have a "helper" column, but I don't think it is desirable to do it in one go and risk making errors for the sake of showing off. Formula for helper column, which I headed "Hours-stop.list"
Sorry answers are 92 and 76. I typed a 22 instead of 11, so both answers were 11 higher than they should have been. A,B and C are the 3 columns of my data. I forgot to convert this to a table, hence the references being what they are. for summing the Hours for all activities excluding those in the stop list. Another sumproduct answer! No Shift-Control-Enter required! Sum of hours excluding Stop list.. Sum of regular hour excluding stop list..
="A"	="C"	="G" ="H"	="B" ="K"	="O"
="=Regular"	="A"	="C"	="G" ="H"	="B" ="K"	="O"
where Hours ,Activity , Stoplist are range references . However Im only getting the Answer when Im Keeping the Stoplist in a Horizontal Column and getting "#N/A" error when keeping it in a vertical column . Cant Make head and toe of this . could you pls comment on this Pleeez. results in an array of values which will be as long as the number of elements in the longer list. Thus , if any one of the lists is 7 elements long , and the other is say 3 elements long , the result array will be 7 elements long , with TRUE / FALSE values for the first three elements , and the #N/A error value for the remaining 4 elements. This is because the comparison is done between the first element of one list and the first element of the other list ; this comparison proceeds down the lists , and when ever one list ends , the remaining results are all the #N/A error values. Excel generates a matrix of TRUE / FALSE results , where one row corresponds to a comparison of one element of List1 with every element of List2 ; thus , there are as many columns as the number of elements in List2 , and as many rows as the number of elements in List1. Sum of Hours excluding stop list? Sum of Regular Hours excluding stop list? I have named the titles instead of showing the arrays, SUMPRODUCT can work with an array in criteria a swell, hence why I list the stop list. Array Formula for Sum of all Regular hours for activities not in stop list? ="=Regular"	="A"	="C"	="G"	="H"	="B"	="K"	="O"
1) Make a Table, just call it mydata.